For once no-one can try to cover up the truth – this is no water tower, no dirt on the lens, and no weather anomaly! 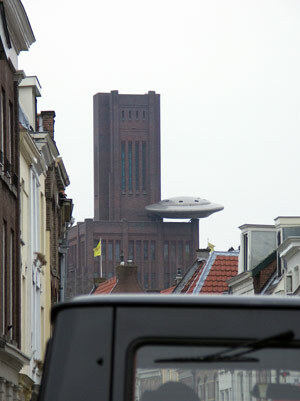 Nope, this time we’ve found a real, actual, honest-to-goodness UFO landing on a building in Utrecht, Netherlands! We even managed to find a picture that was taken during the invasion. Well, it’s a real sculpture of a UFO. That counts, right? Thanks to P wouterse, Bor Smulders and Ronald. so is this a piece of public art? advert? Is anyone able to identify the building the ufo crashed in to? I really like it. It reminds me of the tunnel ventilation towers for the Mersey Tunnel which look like this from above and like this from the Mersey. @Patrick: it’s a piece of art, a ‘leftover’ of Panorama 2000, an Utrecht art manifestation. @cookie monster: it’s the headquarter of ProRail. It’s the biggest brick building in the Netherlands (22 million bricks), built between 1918 and 1922 by Dutch Railways. During World War 2 it was used by the SS as their headquarters in NL. The nickname of the building is ‘the ink pot’ because of its shape. Thanks Roland – i will investigate further. The SS bagged all the best buildings for their headquarters it seems – and frankly who was going to argue with them? Sorry Ronald, i called you Roland! Balderdash, it’s a pot noodle. a very weak post, sorry to say that! It does look like a HUGE flying saucer.. I live just about an hour biking from it.